The example of Olympian Eric Liddell is instructive for those running the ultimate spiritual race. What drives humans to climb Mt. Everest? To summon hidden reserves on the running track? What makes individuals handicapped by deafness or blindness determined to achieve amazing feats? Why do people often react in noble ways during disasters? Is it pride and vanity? Not necessarily. The human Spirit is truly magnificent. The force that propels people to great physical achievements is often the same force that, when coupled with God's Holy Spirit, can help a true Christian be a spiritual achiever and endure to the end! Herein lies a vital lesson — one that reaches into the very core of God's plan for His greatest physical creation — ultimately to become His greatest spiritual creation — man. It is the lesson of spiritual excellence. The life of Eric Liddell is an inspiring illustration of this spiritual quality. Liddell did not understand the true Sabbath or Holy Days or God's master plan, but he did manifest an exemplary spirit of excellence. Liddell's life, of course, was portrayed in the Academy Award-winning film Chariots of Fire. His real life, though, as detailed in such books as Sally Magnusson's The Flying Scotsman, is even more gripping and fascinating. Eric Liddell was the second son of Scottish missionaries to China. Born in China, he returned to Scotland to complete his formal education. Rugby was his early specialty in sports, but his fleetness soon led him to track, particularly the 100-yard dash. He won this event, as well as the 220 and 440, in numerous meets. One such meet, the Triangular International Contest, brought teams from England, Ireland and Scotland together in the summer of 1923. The week previous Eric Liddell set a British record of 9.7 seconds in the 100 — a record that was to stand for 35 years. But this was to be overshadowed by what occurred at the Triangular. Eric won all three of his races at this meet, but it was his victory in the 440 that stands out as one of track's greatest feats. After only three strides, he was literally knocked off the track and onto the turf by an English runner who was bursting for the inside spot. Eric didn't quit. He got up. He sprang onto the track. A 20-yard deficit now existed between him and the top-class field of runners. The gap grew smaller as Liddell strained to catch up. Then he was in fourth place. With 40 yards and the tape to go, he edged into third, on the verge of collapse. However, the word collapse was not in Eric Liddell's vocabulary, at least not during a race. From somewhere deep within, he mustered that special something that catapulted him into the lead. He won the race by two yards! Coaches and spectators were dumbfounded. This was a true exhibition of the spirit of excellence, of utter determination and burning desire, of drawing on an inner strength seemingly beyond normal ability. How do we react when we get "knocked off the track"? Do we give up or do we strive mightily to catch up and succeed? Interestingly, Eric Liddell's running style was unorthodox. He flailed his arms and held his head back, but he got there. We also may appear unorthodox, but we can get there, too. Eric Liddell qualified for the 100-meter and 200-meter events in the 1924 Paris Olympics. The timetables were issued. Heats for the 100 were scheduled for Sunday. Though he didn't understand the true Sabbath, which is on Saturday, Eric was sincere in his beliefs. To the horror of British athletic authorities, he absolutely refused to run on Sunday. Some critics went so far as to brand Eric a traitor. If you would like more information about God's true Sabbath, read our free booklets Which Day Is The Christian Sabbath? and Has Time Been Lost? It was in early 1924, at least six months before the Olympics, that Liddell made his decision not to run on Sunday. Consequently, he switched to the 400 meters and trained accordingly, but no one thought he had much chance at this distance, due to the faster times of other Olympic entrants. The favorite was Horatio Fitch, an American, who obviously remained the favorite when he clocked 47.8 seconds in the semifinals. It was a new world and Olympic record. In contrast, Liddell ran 49 flat on a Thursday, his personal best to that point. Friday morning he brought it down to 48.2. Still, he seemingly posed no threat — except in the minds of a few who knew him and felt he had something not understood by others. That something is what we need spiritually. Then came the final, on Friday afternoon. The 1924 Olympics were held during one of the most blazing heat waves in Paris's history, and this Friday afternoon was no exception. The most undesirable outside lane went to Eric. At the crack of the pistol, he bolted into a full sprint, though experienced runners know you just don't go flat out in this race. At 200 meters, Liddell streaked by at 22.2. Two days earlier, Jackson Scholz of the United States set a world record of 21.6 in the 200. Liddell was only halfway through the race, and was only.6 of a second off that pace. He ran in the 200 himself, taking the bronze at 21.9. His teammate Harold Abrahams, who won the gold in the 100 meters, ran only 22.3 in the 200. So Eric was.1 of a second faster at the halfway mark of the 400 than Abrahams was for the entire 200-meter event! At this point, Liddell led by five meters. Everyone expected him to crack at any time. Sure enough, Fitch gained to within two yards. Then came the long final straight. The incredible happened. Eric seemed to sense the threat. He poured it on. He stretched his lead and broke the tape five meters ahead of Fitch. The time — 47.6 seconds, a new world record, eclipsing Fitch's effort of that morning. Yes, times in track, including the 400 meters, have improved considerably — and so have training techniques, technology and the amount of time devoted to practice. At any rate, the traitor was now a hero. Likewise, though true Christians will be considered traitors prior to the return of Jesus Christ, if we run our race with determination, we will eventually achieve the proper respect and esteem from others for our efforts. Indeed, Eric Liddell earned a great deal of respect in Scotland. Even 56 years later, at the 1980 Moscow Olympics, when a Scotsman named Allan Wells finally won the Olympic 100 meters, Wells quietly stated, "This one was for Eric Liddell." Of course there was glory in that 400-meter victory. Not so much glory of the flesh – not vanity nor pride. It was the glory of achievement, character, determination, self-discipline and of knowing one had done his best. Sadly, this is so often lacking in sports today, but is still evident in some athletes. It should definitely be evident in Christians when we participate in athletic endeavors, but it should especially be present in our spiritual lives. When tempered with humility, this approach is highly valued by God, for it reflects His approach — that of true excellence. Manifested in us and coupled with God's truth, this approach elevates what we do to the level of the things of God. God's Kingdom and Family, finally, are keynoted by excellence. Those who were acquainted with Eric Liddell described him as a man of average talents who drove himself to develop and utilize those talents to an amazing degree. What a parallel to the "foolish things of the world," who are called by God to confound the wise (I Corinthians 1:27-29)! Of course, God's help is involved. But, perhaps this quality of striving for excellence can help us better understand Hebrews 2:10: "For it was fitting for Him, for whom are all things and by whom are all things, in bringing many sons to glory, to make the author of their salvation perfect through sufferings." It's as if God gave humans something in this life that can, in a lesser way, parallel and enable us to glimpse the truly glorious things of His spiritual Family. And perhaps that something is also to act as a potential bridge toward building godly character, if only we are called of God and utilize it properly. Now, you may not be a runner — you may not be at all interested in running. But you are a runner in life, even if you are in a wheelchair. And you and I need to run our race as Eric Liddell ran his — both the race of life and, more especially, the spiritual race we are in. At the tape is the glory awaiting the children of God. But the miracle of this transformation won't happen if we settle for mediocrity. It won't happen if we remain as base and foolish as when we started, but by the change that takes place in us. With God's Spirit and a spirit of excellence, this change will literally astound the world, because it will lead to our becoming very God! The apostle Paul said, "Let us run with endurance the race that is set before us" (Hebrews 12:1). In II Corinthians 12:10 he stated: "Therefore I take pleasure in infirmities, in reproaches, in needs, in persecutions, in distresses, for Christ's sake. For when I am weak, then I am strong." Sometimes it seems that those with physical handicaps do the best job of running in this race. They seem to have more desire to maximize whatever physical abilities they have. Paul himself stands out as one of the greatest "runners" of all time. It's possible he attended the Isthmian Games around A.D. 50. Much of the advice he offered in his epistles draws spiritual analogies from these athletic contests, which provided the inspiration for the modern Olympic Games. For example, in I Corinthians 9:24, Paul admonished his readers: "Do you not know that those who run in a race all run, but one receives the prize? Run in such a way that you may obtain it." Paul went on in verse 25 to contrast the fading branch of wild olive offered to victors in the Games with the glorious crown we will receive at the conclusion of the Christian race. Even Olympic gold will look tarnished in comparison to that crown. Make no mistake. Our crown will be one of glory — not pride and vanity, but the glory of satisfaction in accomplishment, perfection of character and achievement, along with radiant brilliance and power to be given us at that great day. In verse 27, Paul talked about preaching to others. This could well be translated "heralded to others." The herald at the Games summoned the contending runners to their starting positions. This would typify in the analogy the spiritual job of God's true ministry, and is how Paul applied the point to himself. Paul made related references in several scriptures. 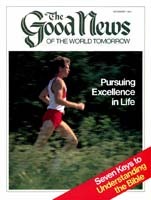 One is Acts 20:24, where he talked about the course or track: "But none of these things move me, neither count I my life dear unto myself, so that I might finish my course with joy, and the ministry, which I have received of the Lord Jesus, to testify the gospel of the grace of God" (Authorized Version). A runner had to press forward, even to the disregard of his life, in the Isthmian Games. This is the approach we are called on to adopt in our spiritual race. And we can't look back! That can cost us the race. Furthermore, Paul showed in II Timothy 2:5 that we must follow the rules — do it the right way: "And also if anyone competes in athletics, he is not crowned unless he competes according to the rules." Eric Liddell will one day come to understand the true rules of the spiritual race. But we have been made privy to that information now. In Hebrews 12:1-2, Paul wrote: "Therefore we also, since we are surrounded by so great a cloud of witnesses, let us lay aside every weight, and the sin which so easily ensnares us, and let us run with endurance the race that is set before us, looking unto Jesus, the author and finisher of our faith, who for the joy that was set before Him endured the cross, despising the shame, and has sat down at the right hand of the throne of God." Here we find a reference to weights that were strapped to runners' legs for training purposes. Sin, in this sense, is a weight we have to work against in order to build spiritual strength. Paul also shows it is an endurance race that Jesus Christ has already finished. In God's view, excellence has a great deal to do with determination, courage and perseverance. Jesus Christ manifested all of these and more in His life, and especially at His crucifixion. Paul himself endured more than most. Indeed, in this context, he is one of the greatest heroes of the track. He who had been the hunter became the hunted: The one who earlier rejoiced at the murders of God's people became willing to die for them. You can read about some of the suffering Paul endured in the latter part of II Corinthians 11. On many occasions, this brave warrior of God stood virtually alone — particularly during his second imprisonment, which culminated in his death. But in Paul there was no giving up, no quitting. He finished the race. In II Timothy 4:6-8, Paul described in moving and emotional language the conclusion of his race: "For I am now ready to be offered, and the time of my departure is at hand. I have fought a good fight, I have finished my course, I have kept the faith: henceforth there is laid up for me a crown of righteousness, which the Lord, the righteous judge, shall give me at that day: and not to me only, but unto all them also that love his appearing" (AV). And, as the story goes, Paul was led to the outskirts of Rome, along the Ostian Way, on what was probably a hot summer day. There, the executioner's axe severed his head from his body. Unwittingly, the executioner participated in a glorious victory in a great race. At his death in the faith Paul broke the tape and secured the excellency that is soon to come with the Kingdom of God. The question is, how will we finish our race? Will we even finish? Will we be victorious? Will we manifest excellence? We all can, and God desires this in us. As the end of this age approaches, let's determine to make full use of the potential excellence God created in the human spirit, and reap more abundantly the rich spiritual lessons and achievements that can help all of us win our great race for the Kingdom of God.